This fun quilt-as-you-go hexagon quilt Best Friends Forever features beautiful embroidery with a whimsical touch. The ladies fell in love with this quilt and the designer at Market. 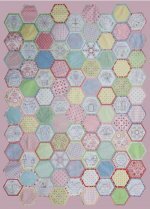 It finishes to 52"x72" and works with Sue Daley's Quilt As You Go Hexagon Templates Size 4 & 5. Get yours today! The original "Divas" themselves will be hosting a trunk show and book signing at Happiness Is ... Quilting! on Friday, Jan. 10, from 10:30 a.m. - 12:30 p.m. This is a great way to kick-off this year's HIQ Diva program and so much more. They will be showing quilts from the book, History Repeated, as well as their Diva quilts that didn't make it into the book. You'll just fall in love with there gorgeous quilts. Paid attendees will receive a $10 coupon toward purchases the date of the event. Sign up now. By joining the Wool Club, each month you'll receive a bundle of six different colors and textures of lucious, hand-dyed wool. This is an excellent and easy way to buid yoursef a wool stash. The wool comes from Mary Flanagan Woolens and each piece is 8" square. Only $21.99 per month. Enroll today! The Wooly Bits Club features a Quilted Crow Girls pattern and approximately 12"x14" piece of pure wool each month. This is a great way to use your Mary Flanagan Woolens Wool Club bundles. With month one, you will also receive a Welcome Pack from the Quilted Crow Girls which contains tips and instructions on wool applique. Each pattern makes a lovely pincushion. Enroll today! Join M.J. once a month for Tips and Techniques with an Expert. Each month this award winning quilter will share a valuable tool or technique to produce beautiful quilts that you are proud to show. She will cover all aspects of quilting. Tonight from 6 p.m. - 8 p.m., M.J. will teach on foundation paper piecing. Don't worry if you can't make it on Thursdays, M.J. is also teaching the class on Mondays beginning January 13 from 12 p.m. - 2 p.m. Register for the Thursday sessions or Mondays sessions today. Join Cindy Sharp of Tops to Treasures and a Moda Bakeshop Chef on Saturday, Jan. 4, from 10 a.m. - 4 p.m. for this class. 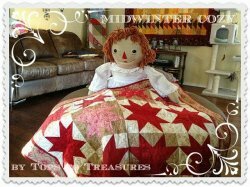 She'll guide you through the construction of this wonderful little quilt inspired by the color red. Enroll here. Join Penny for this fun machine appliqué sit-n-sew on the First Tuesday of every month. This is a fun group and Penny is there to answer your quilting questions. The first meeting of the Lucky Penny Club is Tuesday, Jan. 7, from 10 a.m. - 2:30 p.m. You know it's going to be a hoot! Register here.